Sometimes instead of meaning something literal or universal, the art that we choose to put on our bodies is often personal and a bit complicated. A esoteric panorama of a Greek God holding back the waters hardly means that the person wearing this tattoo likes to eat fish. That is not to say that some pieces still don’t shout out a very particular meaning – to the eyes of beholders at least. Michael Gerard “Mike” Tyson is a retired American professional boxer. Tyson is a former undisputed heavyweight champion of the world and has been in and out of the spotlight over the years for a number of different reasons. 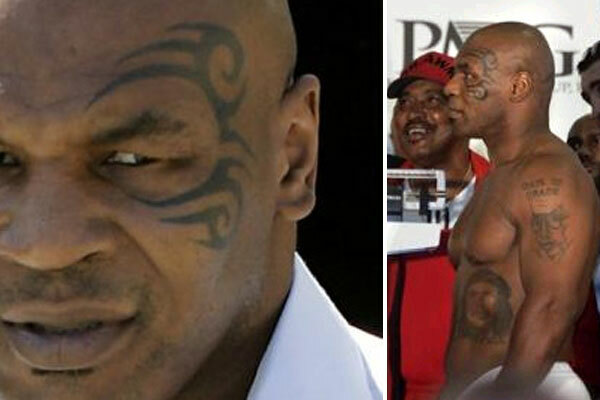 He could have been joking at the time, but hen asked about the tattoo on his face Mike Tyson told talk show host Jimmy Kimmel that his original idea was to put “a bunch of small hearts” on his face, until a friend suggested the tribal design. Katie Price, aka Jordan, is another British media personality slash author slash former model, part-time pop star slash businesswoman. 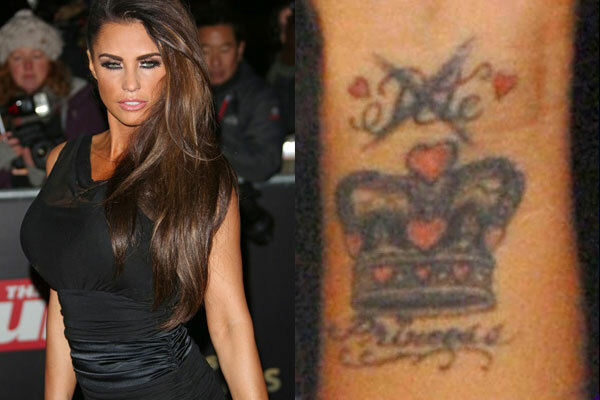 She has the classic crown princess tattoo on her wrist with her x-husband Pete’s name crossed out. I don’t think that their is any other meaning than the obvious in this case. Former “Who’s the Boss?” television star Alyssa Milano has a rosemary tattoo on her back shoulder that she claims shows her deep devotion to religion. 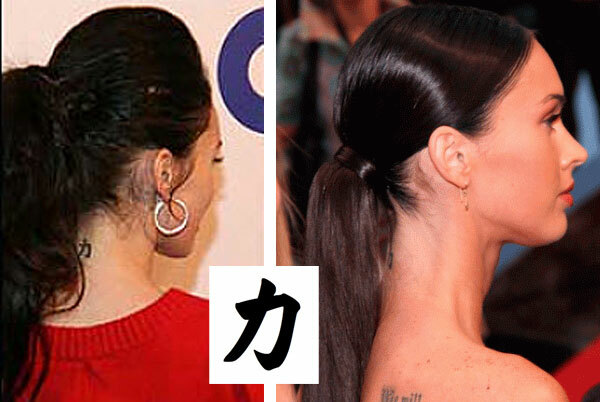 Other tattoos on her body are a collection of Buddhist and other religious and esoteric symbols. Justin Bieber isn’t quite out of the lime-lite yet at least not for 8 year old girls and their mothers. As a 16th birthday present Justin got a seagull tattoo on his left hip. In his case this may be a family tradition because both his father and uncle apparently have the same tattoos. The meaning behind Justin Bieber’s bird tattoo is from the Jonathan Livingston Seagull book. It is about a seagull learning how to fly and learning about life in the process and the cover features the outline of a bird in flight. It was first published in 1970 and quickly became an American favorite. In just two years over a million copies were in print. It remained on the New York Times Bestseller List for 38 weeks, and is still a popular book today. When Miley Cyrus got this little number on her finger she wanted to make a statement for gay marriage. 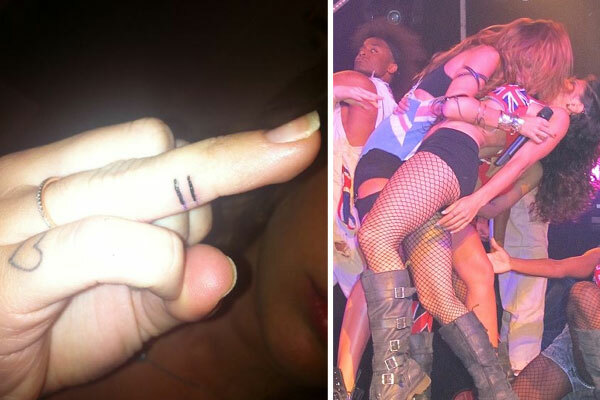 The former “Hannah Montana” star twittered a pic with the caption “All LOVE is equal” the weekend that she got this tattoo which symbolizes marriage equality and is located on her ring finger.